Suntuf Panels for Garden Shed Roof. In 2004 a shed was build and typical PVC panels was used for the roof. Similar to Palruf, but am not certain of the name at this time. It may even had been Palruf. This was desired for having ample light in the shed. The material went through about two seasons then it got brittle and cracks appeared. Clearly this material is almost useless for building. The roof was replaced with Suntuf, which is supposed to have a long life and is UV resistant. Both products appear flexible and strong when new. Suntuf is about $50.00 for a 2 by 12 foot sheet, whereas the old PVC panel is about $30.00 for a similar sized sheet. The shingles were much deteriorated on the small 6 by 8 foot garden shed. It was decided to replace with Suntuf panels to improved the lighting. The hardware store only had two clear panels so two colored panels were selected in lieu. There are two sheds in the garden area, and this shed was inherited, when the property was purchased. It is small but structurally sound, and is used for the hand garden tools. Suntuf panels last as long as shingles, and improve the lighting inside the shed. The top surface of the small attached fuel box was also replaced, with rough pine boards (1 X 12 x 6 feet). Pictures depict the process. 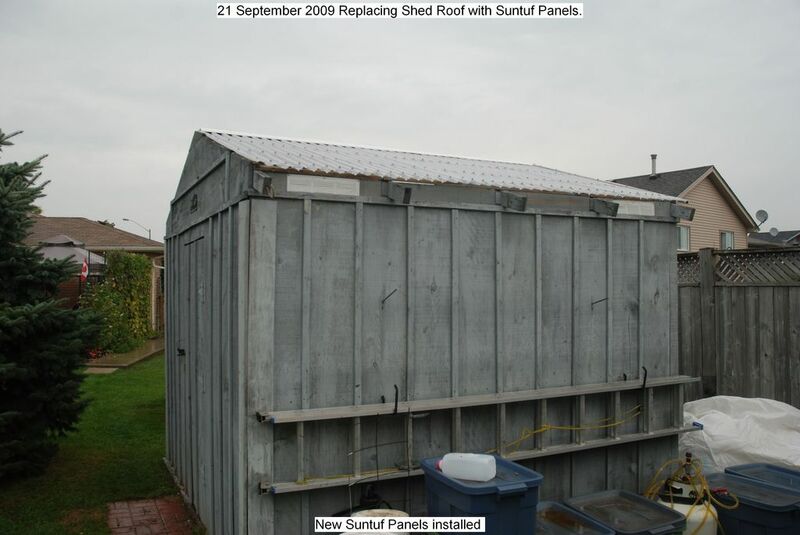 This entry was posted in Uncategorized and tagged Roofing garden shed, Suntuf shed roof. Bookmark the permalink.